Alabaster sculpture has a luminosity and quality which differs from the opaque stones mostly used for this artistic medium. The alabaster that I have used over the years is from the Midlands particularly from Nottinghamshire near Newark, Derbyshire and Staffordshire. It can however be mined in many other countries in the world, such as Europe, the Middle East, India and the USA. The colours are very varied, from browns, beiges, and creams caused by the iron oxide in the natural stones. There are also the pure whites which are especially beautiful, whilst the rare black is found in only a few places in the world. Alabaster has of course been used for hundreds of years and beautiful examples can be found in churches and well-known collections such as the Victoria and Albert and the British Museum. Many of these are carvings of great delicacy and intricacy such as the panels depicting the Martyrdom of St. Thomas Becket. 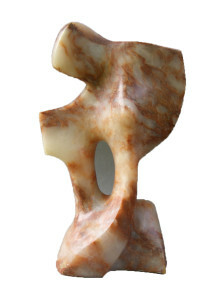 The most recent pieces of alabaster that I have selected for carving were two blocks of almost pure white, that I have transformed into sculptures and which have immediately attracted attention. In fact ‘Affection’ a small sculpture immediately sold. The translucence, especially when set against the light gives an effect not attainable by the other opaque stones such as Ancaster limestone and soapstone. When carving alabaster I need to adopt a slightly different method of approach from that which I use for more robust limestones and soapstones. 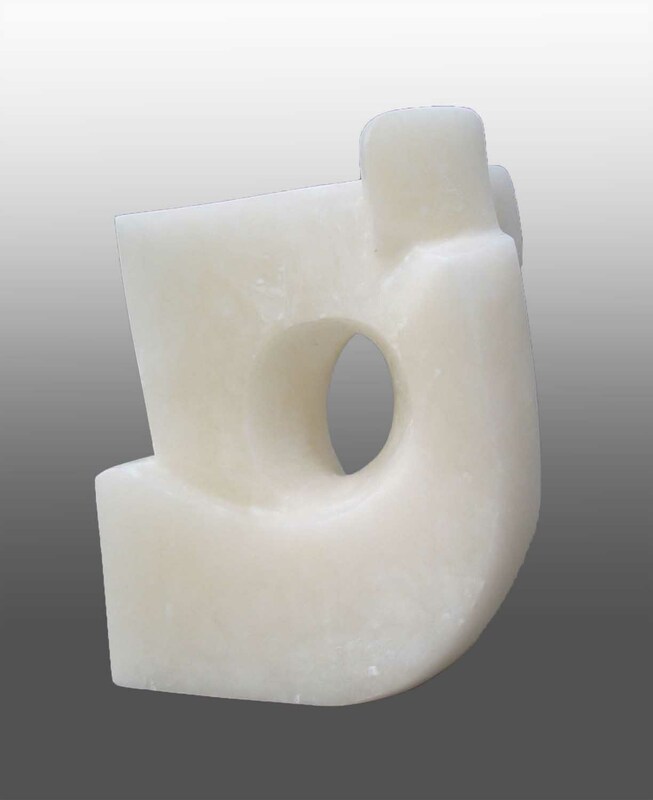 Because of alabaster’s nature and composition, it is necessary never to hit the stone at a right-angle to the surface, as this will cause the crushing of the crystalline structure, known as ‘stunning’ which would produce unsightly white marks. To combat this you need to ensure the carving angle is very shallow. My preference when finishing the sculpture is to produce a fine and smooth untextured surface without too much reflection. Alabaster is a wonder stone used throughout the ages, but still relevant today and perfect in for modern interiors.